Texas GunPowder Seasoning. IT's BACK! This famous spice was very popular in the 90's until the founder of the company, Whit "Pappy" Pinnell, passed away. SuckleBusters recently acquired the rights to produce again. 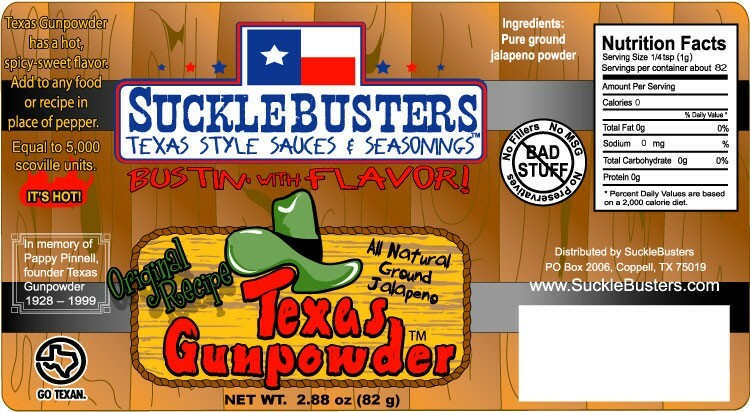 We are very proud to bring back Texas GunPowder in its original formula, pure ground jalapeno powder. There have been many folks copy this recipe but there is only one Original and this is it! Texas gunpowder has a spicy-sweet flavor. Add to any food or use in place of black pepper, but watch out - IT'S HOT! Equal to 5,000 scoville units and like all SuckleBusters products - No Bad Stuff! Tell us how you like to use it with a review below! Original Recipe: pure ground green jalapeño pepper (2.88 oz). 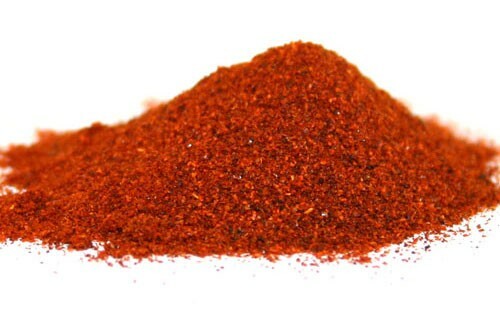 Chipotle Pepper: pure ground chipotle pepper (3.52 oz). Habanero: pure ground habanero pepper (2.5 oz). Ghost Pepper: pure ground ghost pepper (2.5 oz). NEW-HOT!!! great size bottle for gifts. perfect for anything you want to spice up and add jalapeño flavor to. Eggs, stews, steak, burgers, dips, mashed potatoes, A little goes a long way. Perfect for camping trips too. Disadvantages: first time users have a tendency to add too much before realizing just how powerful this little powered jalapeño is. Other than that, this is a more convenient way to enjoy adding jalapeño kick and flavor when you don't have the fresh ones on hand. Fantastic! A nice zing to everything we have tried it with. 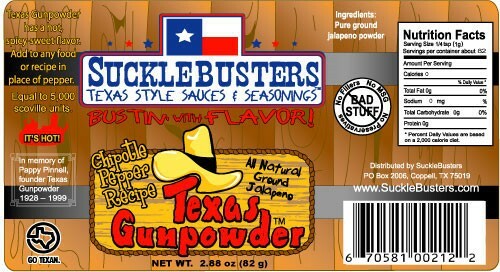 GREAT PRODUCT Texas Foods "Suckle Busters" Texas Gunpowder aka pure jalapeno powder, adds the right "kick" for our Hot Pepper Garlic Jelly. We have won WNC State Fair 2013,2014 award, 1st in Pepper Category, Judges Choice and BEST OF SHOW. 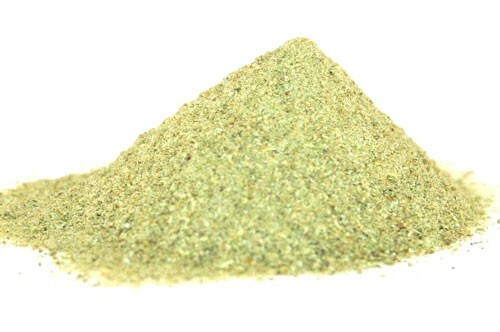 We moved out of Texas a year ago, and my stock of jalapeno powder was getting low, so I just ordered a bunch for my use and for Christmas presents for friends who like a taste of Texas now and then. I use it in just about everything. 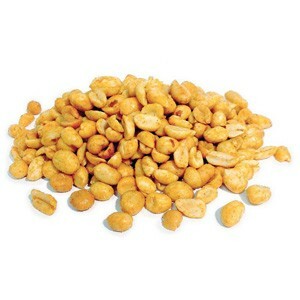 Disadvantages: You have to be careful you don't breathe it in when you are adding it to food. It will seriously mess with your nose! I Knew "Pappy" 25 Years Ago. His Rep In The Army Intel Was Beyond Compare! He Bragged About His "Texas Gunpowder" & Gave Me A Sample! I Tried It In/On EVERYTHING! Loved It On My Omletes & In Chili--Really Gave Everything ZIP! Once You've Tried It...You'll NEVER Do Without!! ENJOY!! Semper FI!! Bought the original at a mall gift shop in Dallas back in the 90's and never thought I'd ever get it again. Still have the bottle! Best all around spice I've ever used. Can't eat a pizza without it....! I've used this since the 1990s. Can't make Chex Mix without it...glad to have found it again. I used to buy this when I lived in Texas. Haven't been able to find it in my new state. So glad it's back! Ummm, I use it in my brownies and fudge. Just a tsp or two is all it takes to get a little tickle at the back of your throat. So danged good. Everybody loves it, even those who don't like spicy food. And it takes popcorn to a whole new level. Try it!